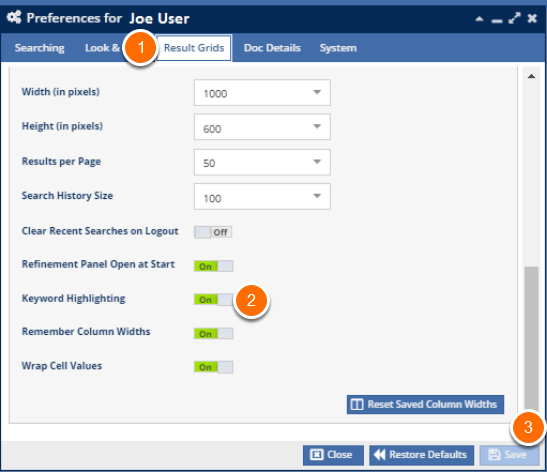 In your User Preferences highlighting can be turned on in either the Result Grids tab, the Doc Details tab, or both. You enable highlights in each window separately. Open your Preferences by going to Start>Preferences. Choose the Result Grids tab (1). Choose "On" in the Keyword Highlighting (2) field (the switch toggles back and forth as you click on it). Click the Save button (3). Choose the Doc Details tab (1). In this example, I ran a keyword dense query using the QueryFlow tool. 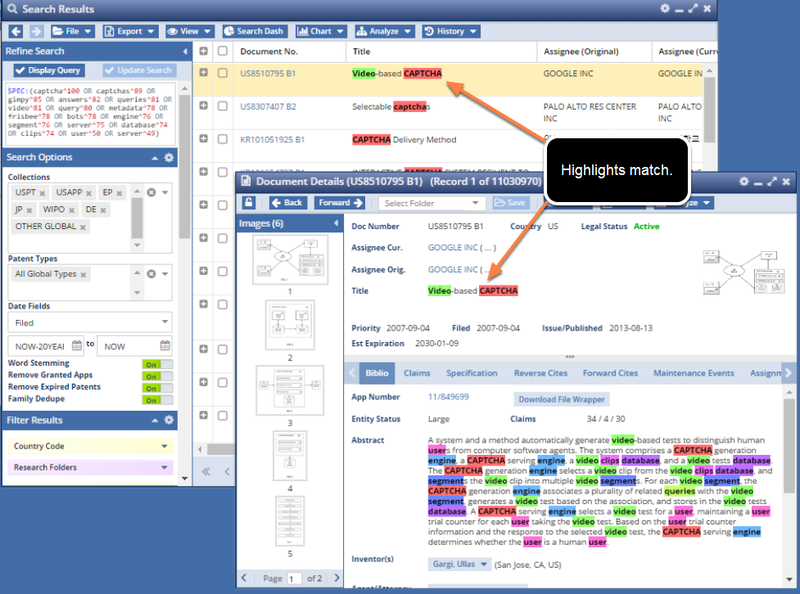 Notice the matching keywords are highlighted in both the Search Result window and the Document Details window. You can also invoke the keyword tool, and highlight terms that you may not have used in your original search. 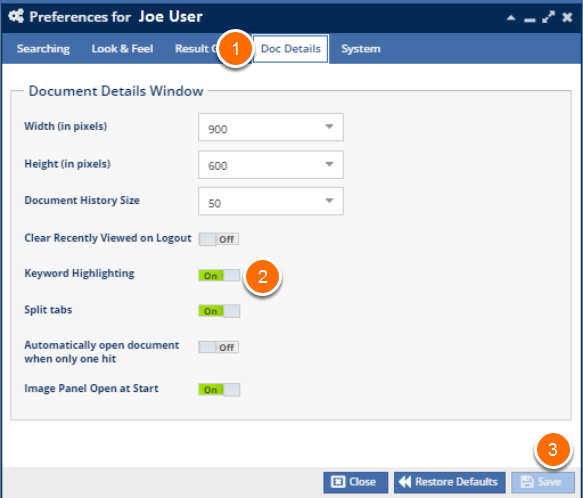 From the View menu (1) on EITHER the Document Details window or the Search Result window, type the terms you want to highlight into the search field (2) and click the Enter/Return key on your keyboard. 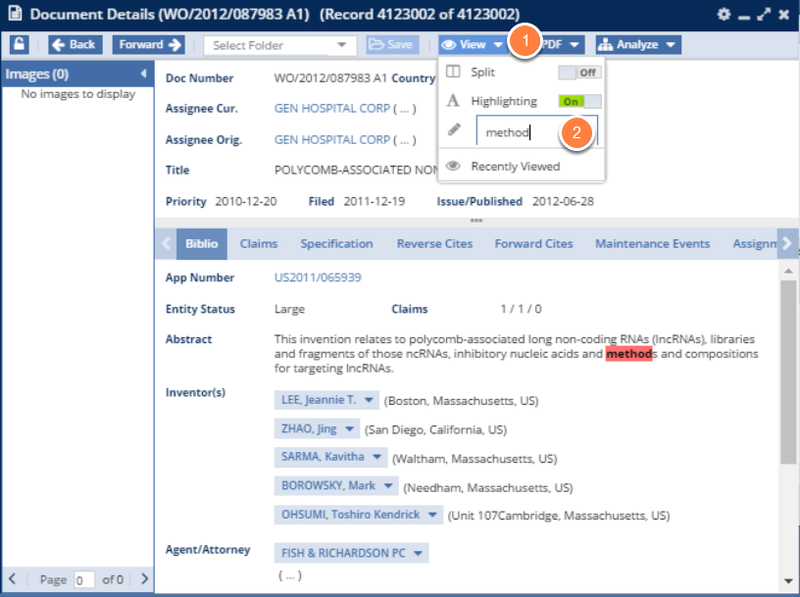 Highlights will be applied to the entire Document Details or Search Result window once you click the Enter/Return key. Most browsers support a search feature by clicking CTRL-F (Windows) or ⌘-F (Mac). Each browser treats search-highlighting functionality slightly differently. For example, on Safari and Chrome, if you click CTRL-F, it highlights fine, but if you page to the next page, the highlighting is removed. Firefox, by contrast, generally maintains the highlighting as you page through documents.